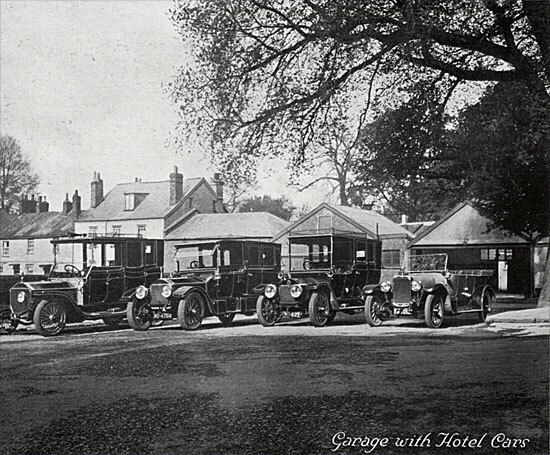 By the 1920's, the Royal Clarence Hotel in Cathedral Yard had its own garage, left, thought to be opposite the Royal Devon and Exeter Hospital. 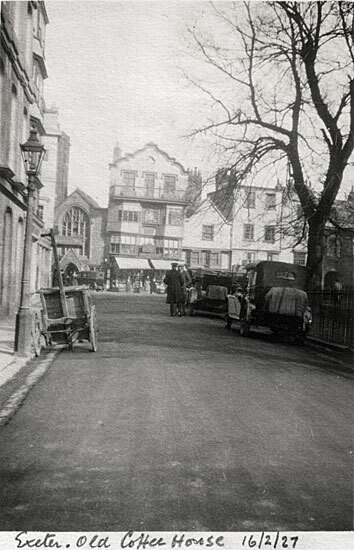 In the photo, right, taken in Cathedral Yard, the cars are parked outside the Clarence. The larger car, has the chauffeur standing by. On the left is a luggage trolley of the type often used by porters from the railway to deliver goods nad luggage. 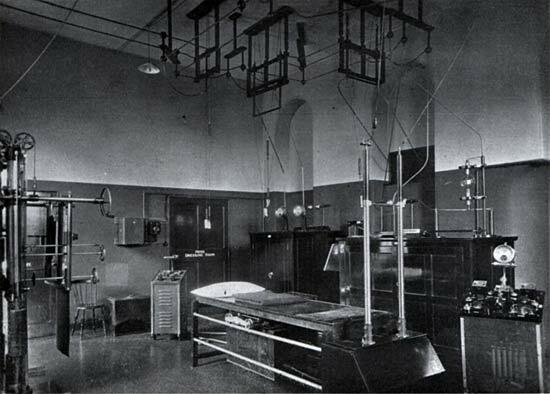 Left is the Operating Theatre in the Royal Devon and Exeter Hospital, Southernhay West. 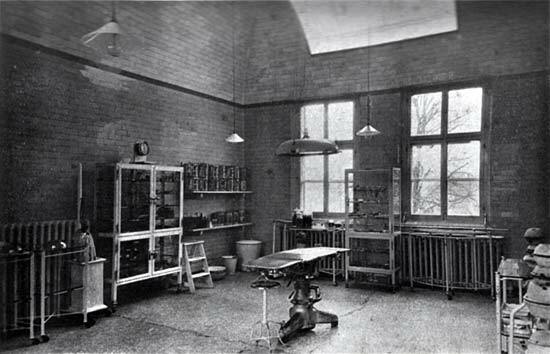 The photo right, is the Electrical Department, which was probably an early form of ECG. The 1929 General Election was held on the 29th May, resulting in a hung Parliament. It was the first election in which women could vote at the age of 21. 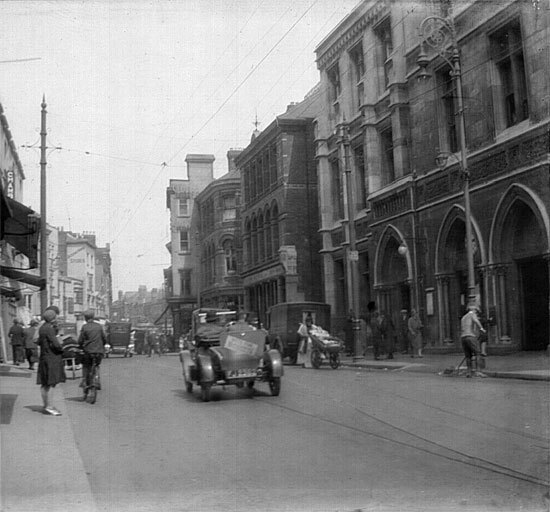 These two photos show an election car turning into Bedford Street (right) and another election car parked in Bedford Street, outside the Conservative and Unionist Club, with the Devon and Exeter Savings Bank in the background. Original stereoscopic photos supplied by John Iffla. Empire Day was celebrated across the country on 24th May, Queen Victoria's birthday. 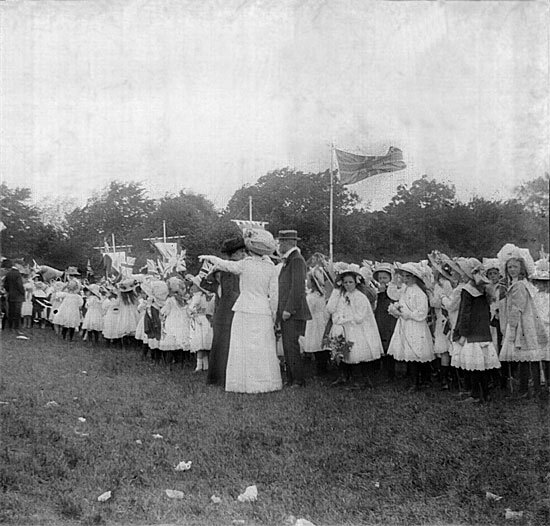 These two photos show Exeter children celebrating the day in clothing that could have been worn thirty years earlier. Original stereoscopic photos supplied by John Iffla. 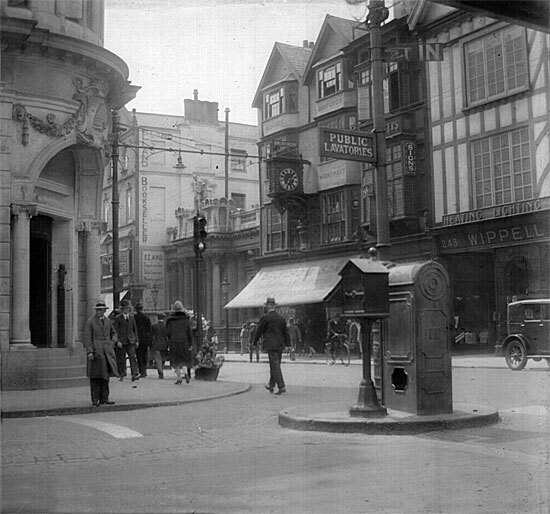 The Post Office that was lost in the blitz is shown on the right of the photo left.In the centre of the photo is Eastgate, which is now occupied by Next. 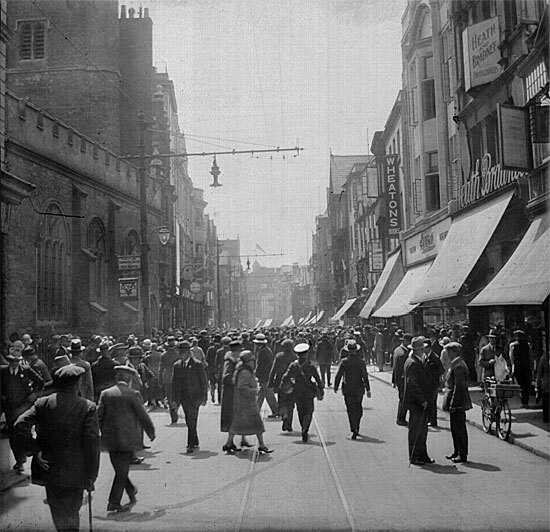 The photo right, shows a very busy High Street by St Stephen's Church – whether this was just enthusiastic shoppers or a special occasion is not known. Original stereoscopic photos supplied by John Iffla. 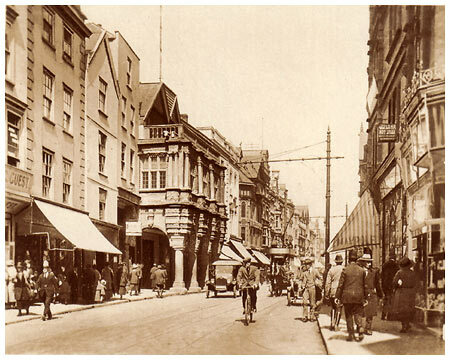 On the left corner is the famous Deller's Cafe of the West at the entrance to Bedford Street. 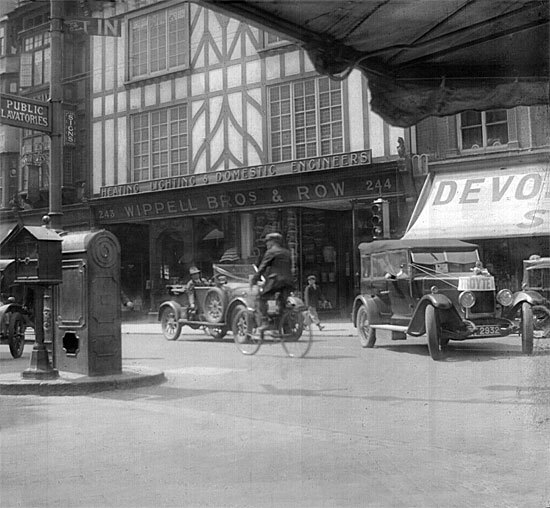 Wippell's, Bruford's and Eland's are opposite – all these building were lost in the blitz. Notice the police phone box and the sign pointing to the underground toilets in the middle of Bedford Street. 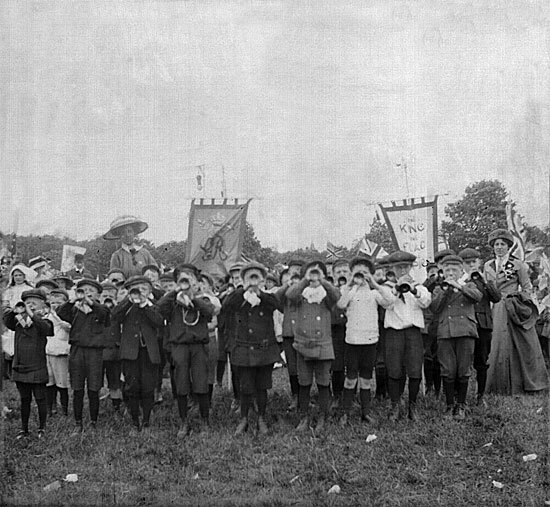 Original stereoscopic photo supplied by John Iffla. 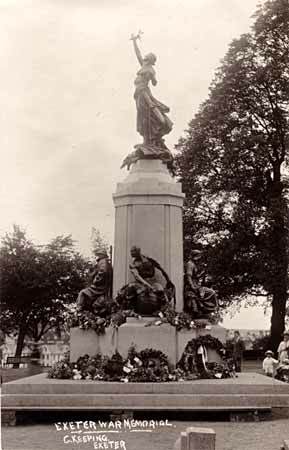 The Exeter War Memorial in Northernhay Park was unveiled on 24th July 1923, by the Right Honourable Admiral David Beatty. Beatty fought at the Battle of Jutland in 1916. He remarked after the battle "there appears to be something wrong with our bloody ships today." 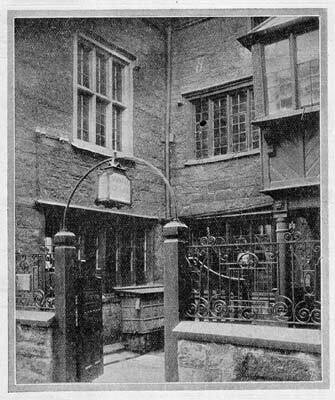 This photograph of Bampfylde House was in the City Council guidebook c 1925. 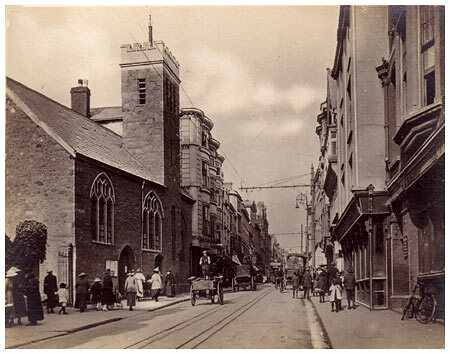 The house was situated just off the High Street, in Bampfylde Street, in what is now Princesshay. It was still privately owned, but was recognised as a potential historic building and tourist attraction. The City Council purchased it in 1934, for it to be destroyed in 1942. The University College of the South West of England was established in 1922. 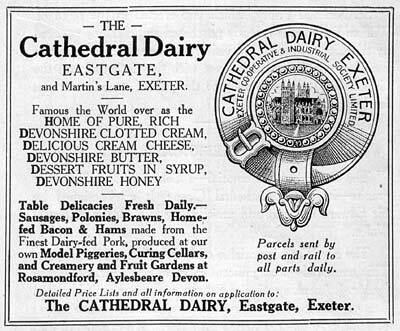 This was the precursor of Exeter University. 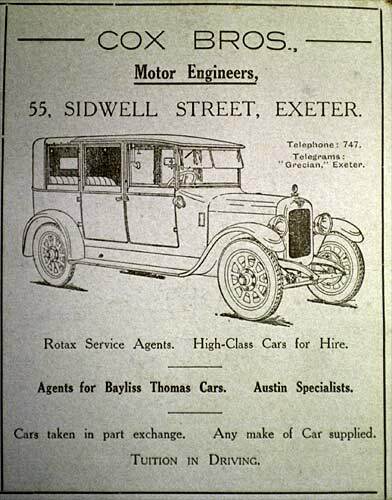 The population of Exeter in the late 1920s was approximately 61,000. The comedian Tommy Cooper moved to Exeter with his parents at the age of 3, in 1925. He lived in Ford Road, St Thomas. The University College of the South West of England charged students an annual tuition fee of £20 to £30. There were three female and three male halls of residence which charged £55 for females and £60 for males. 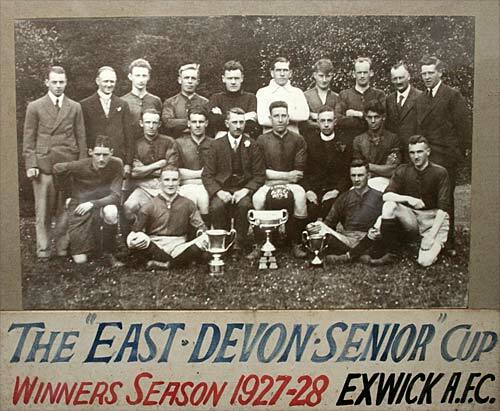 Exwick won a series of football competitions after the First War - notably 1919, 1927 and 1928. Here, the Senior Team are showing off their cup after winning the East Devon Seniors Cup for 1928. Courtesy Exwick Local History Group. 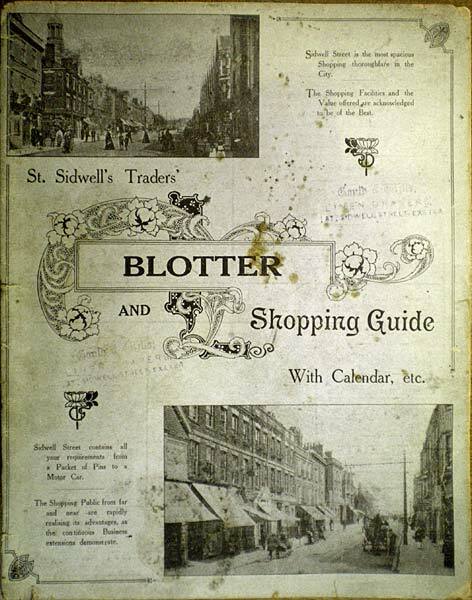 To promote shopping in Sidwell Street the traders got together to print a shopping guide and blotter. 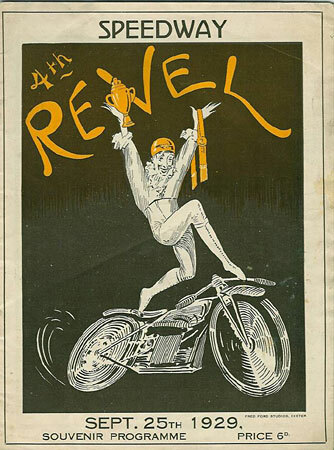 The publication was full of adverts for local companies including Cox Bros, motor engineers. 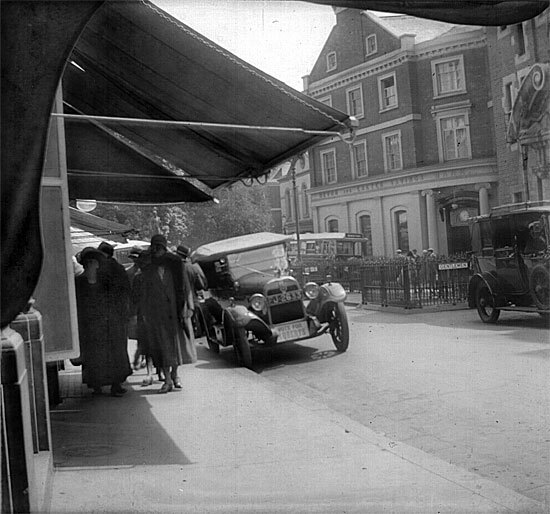 The Royal Devon and Exeter Hospital in Southernhay had 200 beds in the 1920s. In 1925 they treated 2,692 in-patients and 7,476 out-patients. The Devon War Memorial in Cathedral Yard was unveiled by the Prince of Wales on 16th May 1920. In June 1927, Queens Street station dating from the 1860s was destroyed in a fire. It was rebuilt and reopened in 1933 as the Central Station. 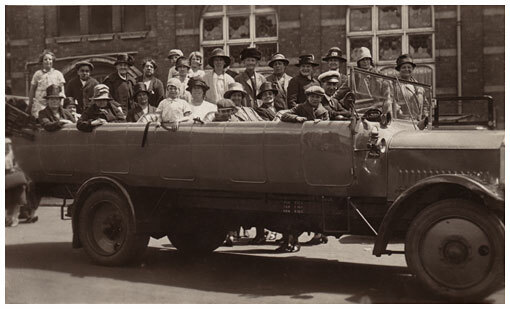 Maudes Motors of Paris Street offered a selection of Clyno cars for between £162 10s and £245 in 1920. We tend to think of horses as part of our leisure life - during the 1920s they were an important part of the transport system for hauling goods short distances. 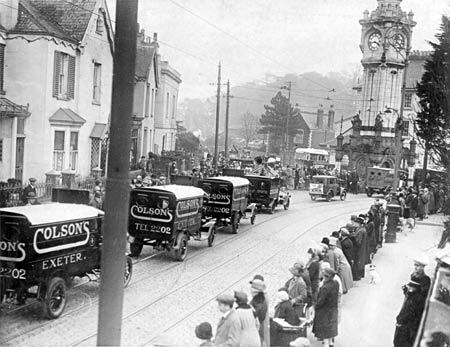 Dating from about 1928, these Colsons vans are taking part in a parade heading towards Queens Street. 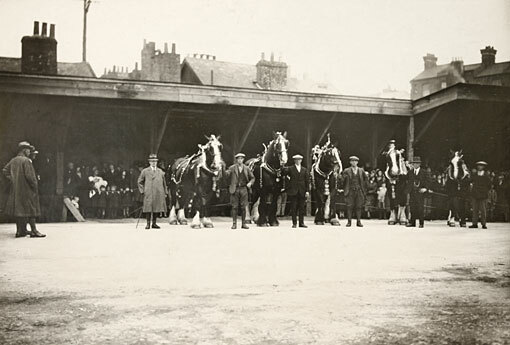 The previous photograph shows horses towards the end of the horse drawn age, while the Colson's vans represent the future. 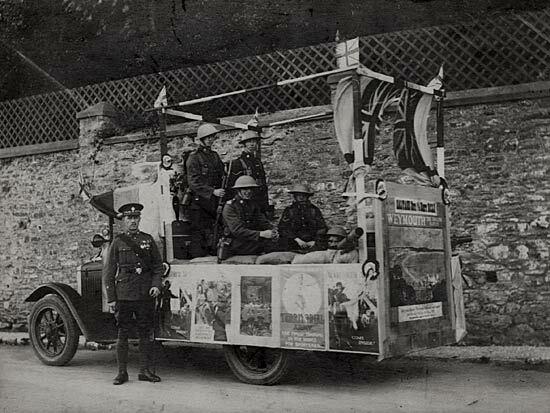 Other vehicles taking part in the parade that day included fire engines and Devon General buses. 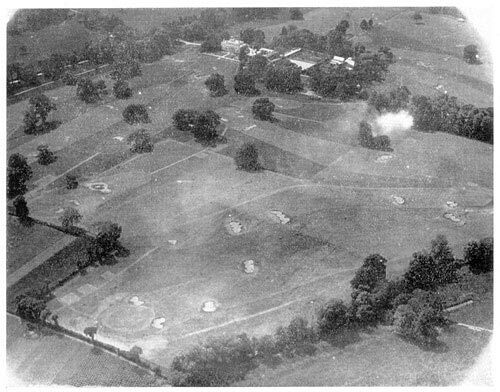 Probably the earliest aerial photograph of the Golf and Country Club in existence. The club moved from the top of Pennsylvania to the Wear House estate at Countess Wear during May 1929. 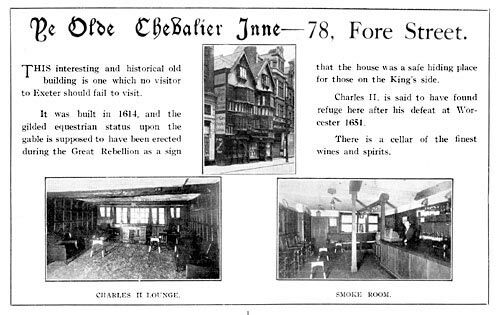 An advert for the Olde Chevalier Inn in 1929/30 - this historic inn was situated at the top of Fore Street, approximately opposite the present British Home Stores. It was destroyed in the raid of May 1942 and was one of the many historic buildings lost that night. 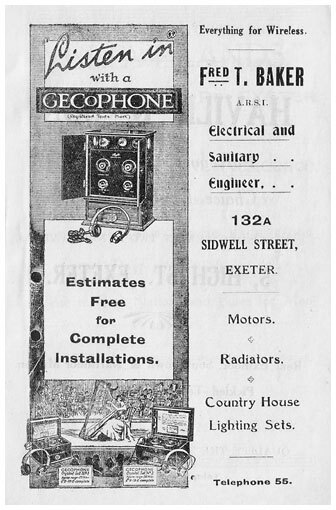 This is the earliest advert I have found so far for a wireless in an Exeter shop. The two models shown were crystal sets and had a range and price of 25 miles and £5-10-0, and 30 miles and £9-15-0 respectively. Circa 1924. 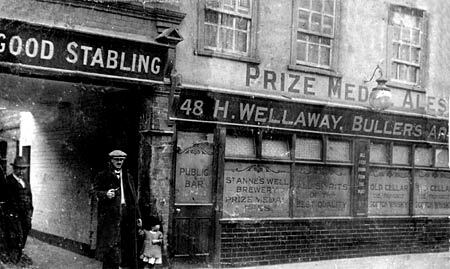 Hubert Wellaway was the publican of the Bullers Arms in Alphington Street between 1914 and 1927. The Bullers Arms became Exeter's first public house to put up a sign welcoming motorists in 1905, although it had always been noted for having good stabling. There was a boxing ring at the rear of the premises. See Boy Wellaway the boxer. 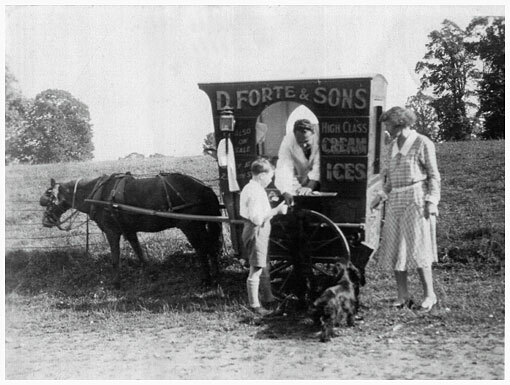 Hubert Wellaway went on to run a fruiterers in Cowick Street during the 1930s. Photo courtesy of Simon Wellaway. 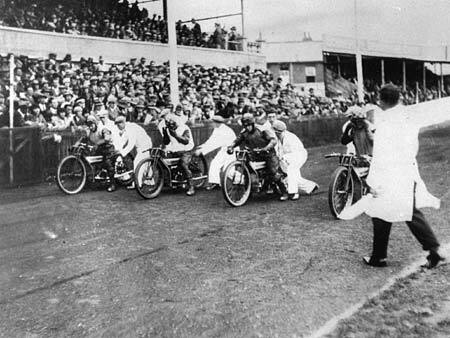 There was an exhibition boxing match at the County Ground between the current British heavyweight champion and Jack Cox, the west country champion in 1923. The Head Weir Bathing Ground had been used by Exonians for possibly, hundreds of years. In 1864, the Council first provided basic facilities, with Frank Shooter the most famous of the superintendents. 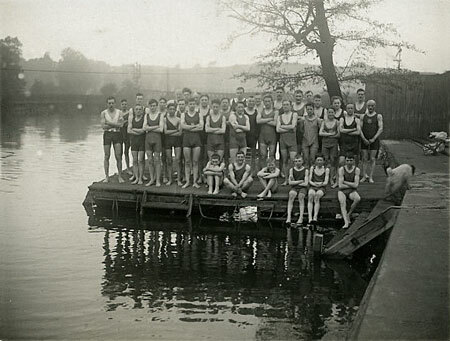 This photo taken, after Shooter's time, in 1927 shows the swimming club members on a pontoon. The King's Alley pool off the High Street was the only public pool in the city and it was not until 1940 that the City Swimming baths were opened. Use of the Head Weir bathing ground ceased by the time the second war started. 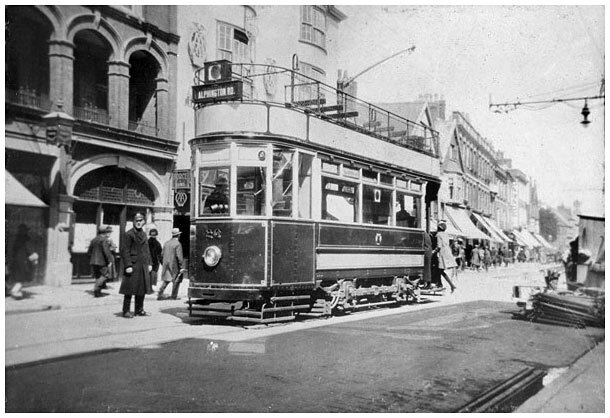 The tram was an important way of getting around. 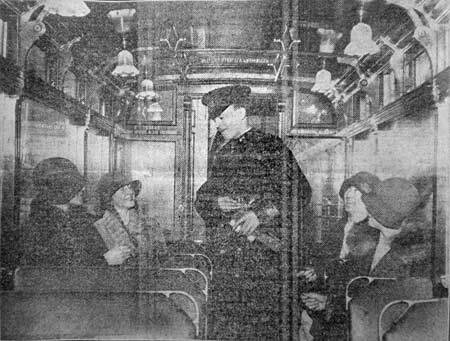 In the 1920s, Worth's published a guide for visitors that included three tram rides. They gave instructions on which tram to catch, and what to see. Ladysmith School won the Football Express Elementary Schools Challenge Cup in 1925. In the side was Cliff Bastin who went on to play for Exeter, Arsenal and England. He was transferred from Exeter City to Herbert Chapman's Arsenal for £2,000 on 27 April 1929. This very well known men's clothing shop was next to the Express & Echo office. 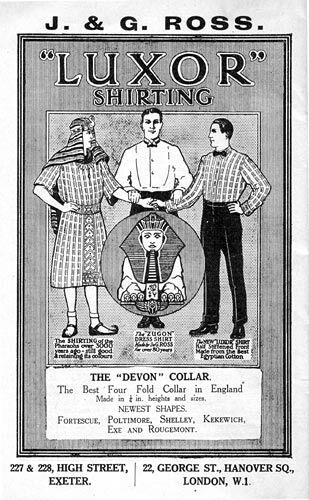 The rather elaborate advert from about 1925, plays on the Lord Carnarthon and Howard Carter excavation of the Tutankhamun tomb in Egypt in 1922. Mr C Ross, had a private landing stage close to Exe Bridge, where his guests, suitably attired for a trip in boaters and blazers, would embark for an excursion to the Double Locks in his launch "Otranto".